When you’re a mermaid lover at heart, nothing but mermaid scale swimwear will do! You’ll love how our icy blue crop top provides stylish support with matching scale print bikini bottoms. Why not get Mariana’s Tidal Teal mermaid tail to complete your mermaid transformation? Walk with your head held high in this beautiful mermaid bikini swimwear set from Fin Fun! Our gorgeous crop top style will turn heads at the beach or pool with its fashionable cut that starts with a v-neckline. Our Youth L-XL and women’s sizes include molded cup liners inside a shelf bra. Wide shoulder straps create a stylish look, while adjustable sliders provide a personalized fit with extra support. Stretchy bands in the back secure with a hook and tie closure. Youth sizes XS-M are lined for comfort, with a stretchy band and bottom tie in the back. 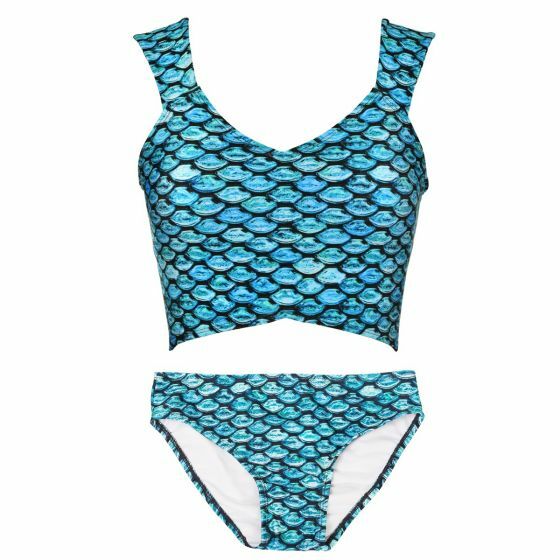 Our Tidal Teal swimwear set was inspired by Mermaiden Mariana who swims the Mariana Trench—which is also an underwater volcano! As you visit www.finfriends.com, you’ll get to know her better, and also learn about her caring personality. Her FinFriend Ricardo the Stingray is always around to help her on adventures. Please hand wash or rinse in cold water. Do not bleach. Do not wring or twist. Lay flat to dry. Ironing or dry cleaning is not recommended as high heat can damage the spandex fibers.